A visualisation project created for Visualizing.org’s Global Agenda Council Interlinkage Survey Data Visualization. Incidentally, one of the first interactive data visualisations I ever created. It is based on survey data gathered from the WEF Global Agenda council. Each council was asked to identify, in order of priority, other councils they would benefit from interacting with. 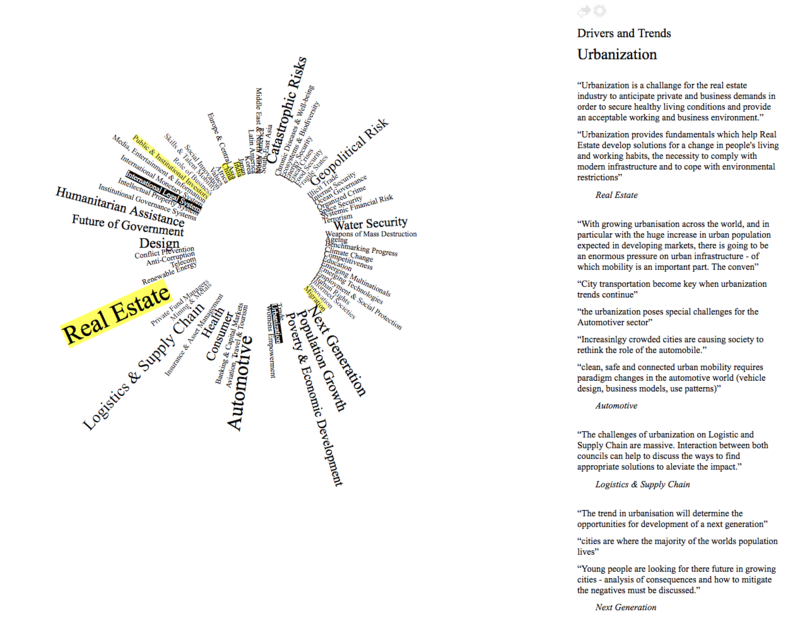 The visualisation shows the interlinkage between the WEF councils in a circular list view using type and color. On selection of a council, the other councils resize based on the importance they represent for the selected council. The colour shows, on the other hand, how strong other councils see themselves connected to the selected one. The column on the right displays the comments of the councils in order of the strength of the link.